All my dear readers, hope you had a good festival time with your family and friends and are by now well settled in your normal day life. My overdue warm greetings, good luck and good wishes to each one of you. 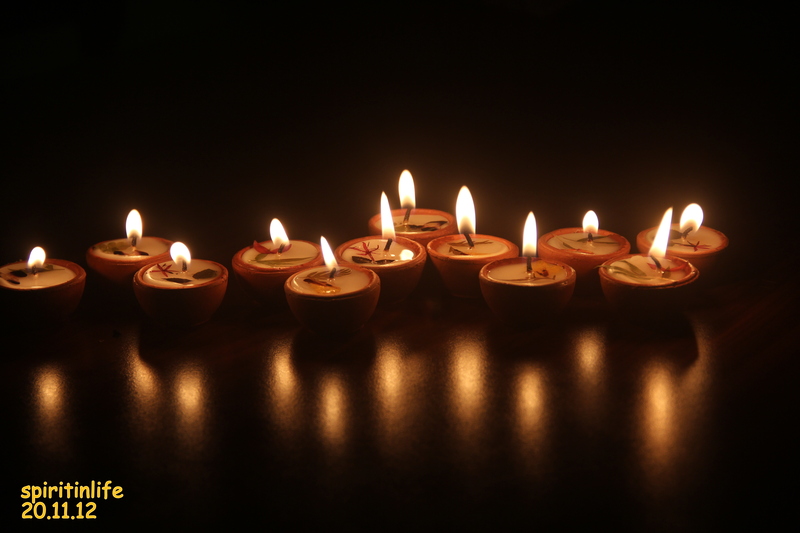 I did not wish anyone personally because this time I preferred to celebrate Diwali by spending a lot of time in teaching my daughter, who was lagging behind because of time crunch as she was working in the office overtime since many days. Nonetheless, it was managed quite well and I foresee that whenever she cannot devote enough time in her spiritual pursuits, she will catch up from time to time. No matter what we are pursuing in our lives at this moment, it is imperative that we should also devote sufficient time in our spiritual development side by side so that we lead a holistic, wholesome, pure and joyous life. It has been a long journey since the inception of Spiritinlife weblog in May’2008. This blog was basically intended to please my daughter and was a birthday gift and it was intended to last for a year only. But then, it has continued and subsisted only because it had the blessings of all my holy Masters. The first year was naive and suave as I was grappling with my own reservations about susceptibility to opinions of people about my spiritual experiences, more so from various spiritual organizations and other known establishments. To my pleasant surprise, none of those uncertainties came to be true. Whatever I wrote was straight from my heart and I think that touched and built the cord between me and the readers. Third year brought me so much closer to my Param guru Shri Mahavatar Babaji, who was so kind enough to let me peep into his personal life, early childhood, his feelings and reactions on behaviour meted out by his people and how he perceived the world with his own eyes and insight. My favourite posts are the ones which are related to our Consciousness and Shri Babaji’s biography Expand your consciousness-II. And they have all come without my demanding, as sheer grace! By the time fourth year ended, I was a confident writer and an experienced extra sensory preceptor. Travelling far and wide in India opened my eyes to not only my own past lives but also what modern India is and the sensibilities of the people living in those places . And at the peak, after I visited Badrinath area the third time in a gap of five months between May and September 2012, I grew into a new person as I found a new light on my spiritual heights. I reached the pinnacle of incessant holy experiences given to me as a grace from God and my own Guru Shri Mahavatar Babaji and I understood the true meaning of self-surrender and grace of God in spite of unfavourable external conditions meted out to me. You must have read those posts where I have described in detail about all this in posts which have the word Badrinath as one of the words in the title…..My last posts ‘New Light, New Life‘ and ‘I get a new life, a new light in Badrinath-I, II & III’ are a testimony to what I have just stated. These four plus years are a canvas on which a whole spiritual journey of a yogi or an aspirant has been etched out. It portrays the struggles, questions, answers, insights, relationship of a teacher disciple, their love and aspirations, the hard toil of the guru on his/her devotee and finally the culmination of all the sweat and grind on both the sides. About a year back or so, on one sunny morning, Shri Babaji commented to me, “Tujhe banate banate mera dum nikal gaya” which means that it has taken a toll on me while I have been making you. You can now get an idea as to how much hard work and persistence goes in the making of a perfect disciple and the bearing of its fruits; of all the penance and spiritual practices undertaken by the seeker and the constant, untiring supervision and guidance of the Spiritual Master, all included. Until now this blog was projecting the journey of a seeker in her pursuit of direct communion with God. It reflects her frustration with her failures in loving this world as it is and yet finding a meaning to her existence, a purpose to live her life meaningfully and to find the Master Planner, the executer of this whole Universe one day. Her own struggles to balance her outer life with inner divine life and to bring all three useful effects into her daily life-gyan, bhakti and karma– spiritual knowledge, devotion for God and love for all others and having the judgement to choose and pick the right actions have created some very original, matter of fact and useful write-ups which will help thousands of other aspirants in future. And this was the main aim of Shri Babaji in helping me to choose the right topics and their substance so that he could tell the world one day that yes it is possible- it is possible for you and several others to achieve great success in your own spiritual pursuits. You are always obedient towards him and your mentor. Today’s sadhana according to Babaji, is something that can be done at home but we need to give ourselves in whatever ways to restore the environment that has been deteriorating at a very rapid pace in modern times. We have to add to our sadhana, which we will be doing at home, the seva or serving the Mother Earth. This is new age sadhana as per his vision and if we care to follow this ideology, then we should get very quick results in our endeavours. To dispense ancient spiritual wisdom through modern tools and technology through internet to cover as many people as possible in the world. To preserve the Himalayan Mountains and the rivers; more so the sacred place where Mahavatar Babaji lives near Badrinath. The recent spate and trend of landslides and flash floods in the Himalayas in the month of August and September are an indication that all is not well in that environment. And to enable and allow Babaji to live in his cave in Satopanth and other winter abode, that environment should be protected. In future, tie ups with other working agencies and NGO’s in the mountains shall be welcomed and solicited in this regard. It is indeed a mammoth task and mission. Dear readers, Spiritinlife blog is now taking a new turn for the suitability of all its readers at this stage. So far, it was the story of one aspirant who was seeking alone randomly without any obvious and visible help yet did not give up until she got what she had set out to become. And this is an assurance to all future seekers who arrive here, either through their tryst of destinies or are suggested by others that please have patience, endure and you shall succeed. From this point onwards, the posts are going to be directed towards you and not me. Hence the next topic would be “Who are you?” and not ‘Who are we? So please keep that in mind and begin a new journey, a journey that has just begun for you. It is Babaji’s mission to enlighten as many people as possible and this blog has begun a world wide open school with headquarters in Badrinath and a regional school in Mumbai!! You can reach out to me at spiritinlife@gmail.com and also write your comments right here on the blog. Those desirous of having a first class degree need to put in extra time and hours. Those who wish to postpone their plans, can do it at their own snail pace and those who have thought or are thinking that they can do it alone because they do not need the help of a mentor or even a Guru, are welcome to have their opinions intact. But they will not be assured of any grace or tutelage if they are stubborn and not obeying the instructions, sometimes given so repeatedly and not respected at all. We all have come here out of our own will and we shall reach wherever we can because of our own understanding, devotion and efforts because God and Guru are very fair and unbiased. It is our sole discretion and choice! So walk on everybody with a fiery passion, a new zeal and a new light!! For the sake of convenience, I wish to review this blog once again and let you know that it divided into three levels-I, II & III. Segment A, which was named Celebrate Life is of level I and belongs to intense knowledge or Teerva Gyan. New readers will have to refer post Expand your Consciousness-II to know what these three new words mean. They are teevra gyan, prachand gyan and prabhutva gyan. Segment C titled Life Sacred is of level III. From the post “Delusion” onwards the blog picks up slowly accentuating towards blazing knowledge from ‘How does one know Atman?”. I have touched upon subjects regarding our Consciousness, Super Consciousness and how to expand our consciousness. Our consciousness is expanded by three factors- our thoughts, our will and our deeds,-sankalpa Shakti, ichcha Shakti and kriya Shakti. You will find many posts here which are an explanation on these powers that we possess and are yet not introduced in us or their potentials have not been tapped fully. In between there are posts which tell us about the food and diet that a yogi should follow and how peace is of utmost importance for him or her because tranquillity brings about stability of mind. The foremost importance of the role of a great guru in a seeker’s life is also explained at the end of this segment in Why is it mandatory to have a Divine Guru I & II. Segment D Part I – Our lost Heritage is a two pronged segment. It covers two subjects and serves two purposes. One is our lost heritage and the importance of restoration of the ancient and new spiritual, heritage sites. Therefore it has many colourful pictures as I visited many heritage sites. Secondly, this segment is dedicated to some of my prominent past lives which I regressed into as the whole circuit and expedition was getting over and it helped me heal my past as well as introduce me to the uncountable prominent good deeds and accomplishments that I achieved in previous led lives. This information not only gave me a strong belief and confidence in me, on the other hand it proved to me that to achieve the highest state of human spiritual evolution called nirvana or moksha or enlightenment, we should qualify to attain it by being pure, virtuous and selfless in many lives so that we accumulate a huge number of pious karmas. And that life does not end once we cast our bodies on the Earth. There is a similar life in the skies and we continue to grow, get rewarded or punished according to our present and past deeds and continue to evolve even out there!! Segment D Part II –Far Into the Journey Unknown represents this topic. It also has reflections and anecdotes from my own knowledge of Occult as given by my Gurus. This is the reason I never get tired of thanking them all the time because these subjects are not handed down by our parents and neither are they taught in any regular school. It is a gift given by our Spiritual teachers so that we can navigate our voyage easily and with some basic knowledge of the other unknown worlds we learn to live our lives on the Earth peacefully and are in control of our thoughts, deeds and present lives. My undying yearning to see Babaji and thank him personally for the gratitude I have harboured over the years kindled enduring flame to touch his holy feet. My wish to go to Satopanth and meet him personally made me cross all sorts of barriers physical, mental as well as spiritual for a decade.. The last part of segment D consists posts which narrate that part- A Voyage to Eternity-A Pilgrimage to Shri Mahavatar Babaji’s Ashram at Badrinath. The new segment E appropriately named New Light, New Life begins with posts which are my experiences regarding my failure to meet him personally because of bad weather and non-supportive provisions and backings. Yet I was given the highest blazing knowledge Brahma Vidya which I had longed for,on my way back home in a car through mental transference. The purpose was fulfilled in a very bizarre manner. It is now that I sort of understand to some limit, how intricately everything was woven and planned to give me those experiences to realize. That I should be surrendering to God in each and every circumstances and only after I had done so at the highest level, could I have a direct, face to face experience with the Divine!!! Oh! What a fantastic journey this has been!!! And finally, each segment is a book in itself. As the time becomes right, these segments will be published as a single book on Kindle and hard cover also so that Shri Mahavatar Babaji’s life, glory, mission, future forecasts and world mission can be documented forever and can be used for posterity. And the income of the books that will be generated will be used to spread his teachings, aims and mission all over the world. Hope the old as well as the new readers will now get an overview of this complete blog. And after getting to know it, the seriousness about the aims, objectives and the mission of Shri Mahavatar Babaji will automatically seep in. This should make them more one pointed and focused and they can plan and chart out their future spiritual life journeys. Any help, guidance and support that you wish to take shall be provided, it is my pleasure! Now to end this post, a small narration of a beautiful and short spiritual experience that I had only yesterday less than twenty four hours ago……. Last night was an uneasy night for several reasons. I was not getting any sleep. The fundamental concern was that I still hadn’t received very clear instructions regarding the content of the new write-up and time was just flying away. The post was due today. So I sat down on the sofa peacefully after the day was done, and on impulse went back to my heavenly experience that I had in Karna Prayag. (see the later part of the post) I could again see some drizzle of golden haze and thin rays of light in my vision. The very fine drizzle precipitated in front of my eyes and calmed me down completely. Although in the last few days, I have been repeatedly reassuring myself that I will not be let down and my work will be delivered well on time, I became a little anxious by this time. Ever since I encountered this extra special spiritual experience in the Himalayas, I have been silently telling God that henceforth I shall never ask anything more because without my even asking or demanding, already so much blessedness and grace has been bestowed over me that I do not wish to seek any more favours. Whatever new has to come should come as just grace from God’s side. Whatever comes will be taken as Prasad and Kripa, mere Grace. So sitting with so much peace and harmony, when I peeped inside myself, I saw that there was nothing inside me except grace, wonderful blessedness. And that finally I had arrived at a stage where out of unconditional love, the seeker surrenders selflessly and gracefully and grace comes automatically. Knowing and experiencing divinity to this great extent, I have arrived at a stage where the ‘jeeva’ or individual being dies out completely and only God exists; only grace of God exists. This is full surrender when the devotee dissolves himself or herself and immerses its identity completely into the consciousness of the Highest Force. So whatever comes from God, at whatever time, even knowledge or revelations is absolutely acceptable to me……I have no say in it. I got my ideas about this post in the early hours of today. I have understood that from now onwards my Guru and God are giving me lessons with a new method. The higher I go, the subtler it becomes. I should be extremely patient and never forget that God is forever working and guiding me but sometimes I cannot read in between the lines so I should wait- wait more patiently. When is it that God is not with me? We just have to be very patient enough to know that there is no moment ever when we are not in the presence of the grace of God. We only have to be in complete harmony and union, that’s all! This entry was posted on Tuesday, November 20th, 2012 at 5:53 pm and is filed under Uncategorized. You can follow any responses to this entry through the RSS 2.0 feed. You can leave a response, or trackback from your own site. It is a wonderful idea to come up with an organisation to accomplish certain goals of environmental protection and spiritual advancements. I m also growing with this blog so definitely it holds a very special place in my heart. Please let me know in whatever way I can assist you. I ll try to give my best. Dear Garima, it is refreshing to hear from you and others. Thanks for wanting to becoming a part of this worldwide crusade which has begun now and will spread slowly to other parts of the world also some day. NJJF is a brilliant idea and with Babaji’s blessings, it will accomplish great results. There is still time for it and as soon as the right time arrives, we all will hand out our help, contributions and skills appropraitely. I am just waiting for that time. Until then, grow as much as you can by spreading your wings and soar high. Jai Babaji. You are a bright star and I am glad you are here. We all will work together and I will surely remember to ask you in contributing your strength, skills and financial assistance in future in building up NJJF. And before that time comes, I assign you a task. Kindly teach Parul ben(in case she can’t), Rashmi ben and others to handle the computers and reach spiritinlife. Kindly devote some time to them. They should be able to read and absorb the posts and they will benefit a lot with your help. Please take their basic computer class on a relaxed day, as per your convenience so that they can read the posts. Get them initiated. I will be the happiest person to see the senior ladies empowered by computer technology…..Connect them to Babaji and me. Will look forward and wait for your response. I shall surely do your given task and have a word with Parulben today only.. As Babaji always makes me feel that real blessing is to connect his desired souls with him.. Thanks a lot for all.. and I shall look forward for any other contribution / task by you..
Pranam with love and light..
a pleasant surprise. Thank you Babaji and Sarikaji for coming up with the idea of this foundation. Thanks to this foundation we are all going to get the opportunity to do a lot of seva too. Please let me know how i can be of service. 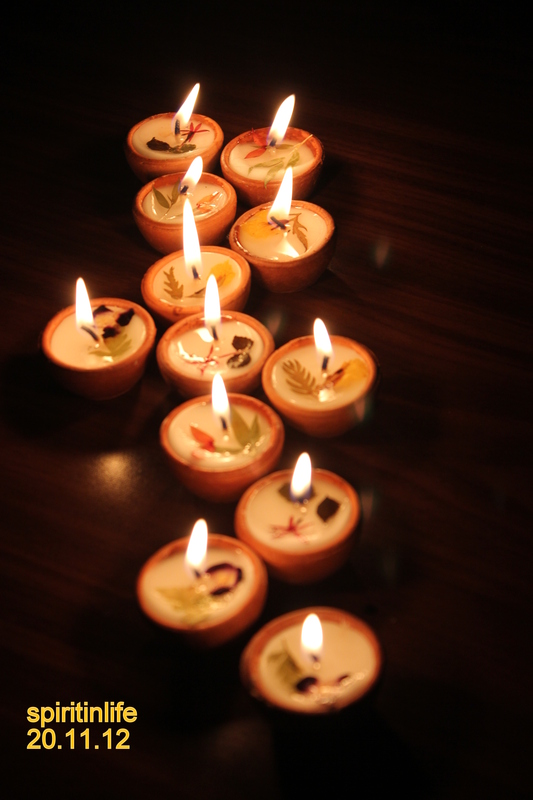 I love the last pic of the diyas, was staring at it for a long time. Ohm, Doing great job sarika ji. Really thanks a lot for the all writings, i am sure i came through this website by the intention of guru babaji. thousand and millions should come thrugh this, the post about babajis life was such a great great read, no words really. please convey my love to babaji, and make me to the right way to the njana to hep others, to let me do the right thing, to give love and happy to all. and last to get all together in the path of wisdom. Dear Midhunji, Welcome on the blog and feel at home here. I can see your happiness coming across in getting in touch in some manner to our Holy, Lotus Feet, Divine figure, Shri Mahavatar Babaji via this website. Your wishes are genuine and similar to many who arrive here. I am grateful, very grateful to Babaji for making me a medium in expressing this ancient sacred knowledge. Thank you very much for all your kind words, they are inspiring. Please read the articles and you will feel very satisfied and liberated. Sweet Ma and Babaji I feel chosen one to be here.. May I be of some use to Babaji and his mission. may NJJF contributes in big way to establish, Babaji mission of creating “an egalitarian society for man’s happiness, prosperity and well being”. By enormous patience and sustained effort of yours this foundation has finally got established and ready to embark new and glorious Journey on revival of ancient sanatan dharma. “there is no moment ever when we are not in the presence of the grace of God. We only have to be in complete harmony and union, that’s all!”. What else one need when always living with infinite nectar. Humble pranam to you and all beloved Masters.